121 x 178 x 6 mm (4.75" x 7" x 0.25"). Made in Germany 1920s - 1930s. One side of the instrument is used for addition and the reverse for subtraction. The stylus advances each colmn by the number to be added or subtracted, with carry possible to the next column. Although this model is a little large, these were the mechanical pocket calculators. "Made and presented by Addiator Gesellschaft, Berlin. This instrument, which shows the latest development of the Troncet type of arithmograph, was placed on the market in August 1920, and 100,000 examples were sold within a year. It is attractively designed on mass production lines, and various models are made, adapted to different systems of coinage, weights and measures." Many cheaper versions of the "Addiator" design were made over the years. GEM Sterling adder, dating from 1880s-1890s. For more information see GEM in the Mechanical Calculator section. 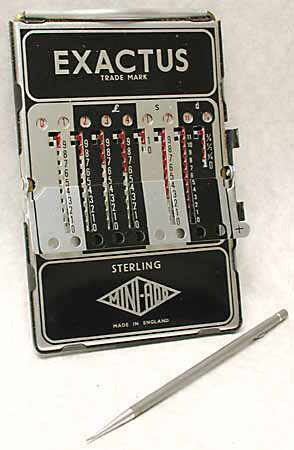 Kingson sterling "Addiator" type calculator, "Empire Made" 1950s - 1960s. 40 mm x 160 (1.5" x 6.5"). Addmaster sterling "Addiator" type calculator, "Empire Made" 1950s - 1960s. 65 mm x 126 mm (2.5" x 5"). Has a flap which flips over to change from addtion mode to subtraction mode. There is more information on the Exactus Mini-Add on the associated Vintage British Calculators site.